A couple of hundred feet behind the team, as far as we can see, is open water forcing us to change our route ahead. Polar Huskies have big hearts and brave spirits - sometimes too brave. Today we were chasing a polar bear! Paul had just put Aksel in lead with Cola to give the team a little burst of speed after lunch. The fog was heavy making it hard for us to see. That also meant a lot of work for Cola as Paul had to navigate by compass all the while yelling commands "Geee Cola - Chaaaaw Cola.” She had been doing great, but putting Aksel as well could help keep the pace while she did the thinking. It worked. 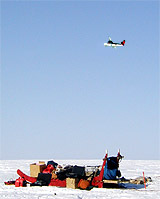 The team was going pretty good, running on the hard sea ice, and as they approached a small island, they really got flying. Basking in the midnight sun Terex earns this weeks Polar Husky Star. Last year's "Puppy Of The Year" Terex is now one of the biggest dogs in the kennel. He is HUGE, very muscular and very intelligent. Terex is a hard worker, but only two years old he is still playful like a puppy. He runs in wheel on Paul's team with his goofy brother Lipton. Mille’s team couldn't keep up any more. Looking ahead and watching Aksel way in the distance, Mille was sure he was on the hunt for something. Hoping Paul realized it, Mille just tried to “yip” her dogs to go faster also. Paul had realized it but was having a hard time stopping the team. Flying around a corner, he finally got the snow hook anchored at the very moment Cola and Aksel made a 90 degree turn. They had their noses on the ground planted in tracks as big as their heads. They were fresh polar bear tracks. The bear had only recently disappeared into the mist. Barking, howling, and throwing themselves into the air as well as jumping in their harnesses, the dogs tried to pick up the chase. We stared into the mist wondering how close the bear was and mentally preparing for the worst. Following his tracks for few minutes, we could see by the length of the stride (the distance between individual foot prints) that he had really been flying. Unfortunately for us, he had taken the exact route we had planned on following: up and over an island ahead. Instead, we decided to take an alternative route only after we finally got the dogs calmed down and convinced them to go the other way (Cola REALLY disagreed). It turned out the alternative route involved quite a bit of mountain climbing. That calmed the dogs down really quickly. It was very hard going, but with us pushing and them pulling with every muscle and all their hearts we made it to the top. The fog lifted at the same time and we were treated to a very impressive view. Paul is "inhaling" Leak Soup with noodles in our little home sitting on Brentford Bay. Looking down we decided we better throw on some chains around the front of sleds to slow them down for what looked like a fast descent ahead. That turned out to be a good call. As we were flying down the steep side, we had to come to a screeching halt when Paul spotted a mother polar bear and her cub passing the bay ahead. So, we sat on the mountain side under a blue sky, watching them cross up ahead without notice with an incredible landscape of mountains as a backdrop. It was just like being in a IMAX theater watching a spectacular movie... except even better. It was real! We actually watched a movie yesterday!! Yes, we are about 340 kilometers (200 miles) from the nearest community, but we were invited to the "French Base Camp Theater" to watch "The Gladiator" and eat fried caribou meat and frozen mars bars for snacks! Remember last week, we said we met a French/Quebec team who were dog sledding this area, but that we did not expect to see them anymore. Well, we were wrong. They decided to sleep less and travel harder, and we ended up having quite the schedule together for 3 days. They would run from 5 in the afternoon to 1 in the morning. The first 10-12 miles they would be on our trail then they would catch us, have lunch in our tent while we ate breakfast. They would then leave to ski out ahead of their dogs for another 20 km (about 12 miles) making a nice trail for us to depart on a couple of hours later. Once we got to their new camp site, it was time for us to eat lunch in their tent while they were ready for dinner. 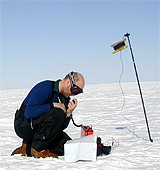 We also tried to connect with the snow mobile team [http://www.arctictrek2000.com] we met in Gjoa Haven who were traveling to Resolute on the west side of Boothia Pen and Somerset Island to hear which conditions they had experienced. Our handheld sat phone only works occasionally now (and we expect to loose the sat link completely within the next day), so Paul got on our HF radio instead. Otto and Chris were very helpful giving us great info for the trail ahead! Stopping while the other team was eating dinner meant we were treated to fried caribou, Chinese soup, and other yummy stuff. Then, we departed with the our dogs making a new trail for another 10-12 miles while they would sleep. By the time they got up to run again, we were in our new camp and it was our turn to sleep. Pretty smart, eh! And lots of fun. But yesterday was the end of it as they were scheduled to be picked up by an air plane on the 14th taking them to Resolute, and then eventually, home. Though it meant we had to take an extra day off, we decided to wait around and see them depart. It wasn’t only because we had planned a "DVD night" in their tent using their IBM ThinkPad computer (turns out Frederick works for IBM.) to watch a movie powered by solar light! No, we did have a more "serious" reason for hanging around. We have run into open water. Traveling up along the coast of IBM Boothia Pennisula we were surprised by a large belt - a lead - of open water. At some places, it extended all the way to shore. This meant for that we had to travel on land, crossing patch after patch of rock and gravel, and that there was not a whole lot of that nice smooth hard packed sea ice we expected. More importantly, it made us seriously wonder of what was ahead. The route the hunters in Taloyoak had recommended to get from Boothia Peninsula to Somerset Island was crossing Bellot Strait on the east side. They told us it was very important to cross at a specific point and that we should stay far out on the sea ice away from land and the mouth of the strait. The current is very strong in the strait and there is always open water and bad ice. Now, with this belt of open water lasting for at least a hundred miles as far as we could see and had traveled, everything indicated that this would probably not be safe. The crossing is about 20 miles so it is a long stretch to travel in risky conditions. After studying some satellite photos online, (once again the Think Pad did wonders) we did not feel any better. Actually, we felt worse as there was even more open water than we feared. Our solution was to wait for the pilot flying in to pick up the French team. He would be coming from Resolute, flying over the area and could probably give us a pretty good idea if there is open water on the west side of the Boothia Peninsula and Somerset Island. If not, we could attempt to cross land to get over there. If open there was open water there too, well, then we really did not have any options. Our new friends - the French Team [http://polarlys.asso.fr ] - taking off in a Twin Otter air plane to go home. We were all anxious to see the pilot arrive. He was to land the small Twin Otter air plane by our camp sites around mid afternoon if the weather stayed good. So, we passed time by watching the movie which was a pretty wild experience sitting in a little tent in the middle of nowhere. It is so "nowhere" that the lake we were on was without a name. We all decided to name it "Gladiator Lake!” (We do doubt we can convince Canadian Map service to do the same though.) By mid afternoon, the sky was clear and we watched the plane approach. He circled us a few times, then circled again, flew low over us... and past us, to finally land a little over a mile a way. He had almost decided to turn around as he thought the drifts on "Gladiator Lake" were to high, but then luckily he saw a patch he could use for landing strip. That meant we had to quick load the French sled, hitch their dogs, and send them off to catch the airplane. Paul went along to talk with the pilot. It was bad news - and good news. The bad news was that, yes indeed, the strait we had been on our way to cross was highly unstable with lots of leads and open water. The good news was that the west side of both Boothia Peninsula and Somerset Island have excellent ice conditions. Now, we just have to cross land, but better safe than sorry - wet. In the mean time, the plane was loaded. Off our new friends went... going home. It is always a very strange experience to stand out here and see a plane take off. You feel this lump in your stomach, even in this case where it really had "nothing" to do with us. But, once we were back in our little home out here - our tent - we felt good again. As a matter of fact, we are happy it is not us that had to leave quite yet. Pretty soon this will have been our home for 100 days! It might sound strange that we call our tent "home,” but that is really how it feels every night when we pop it up and make it familiar, though every day with a new and spectacular view. Now, that is of course very different from the traditional nomads. Inside the igloo in Taloyoak - Notice how bright it is. There is a large window in the roof made of ice! Nomadic cultures, like the Inuit, lived in different dwellings specifically built for summer or winter and moved following the seasons and the food source. They did not move every day. Once they found a good spot for hunting, gathering, or fishing, they would set up a more permanent camp and stay there until food supplies or a change in seasons forced them to move. 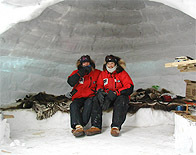 The Canadian Inuit often built igloos. Note that igloos can be made out of snow, but that the "summer version" made out of animal hide, drift wood, and whale bone is also called an igloo! Now, of course, Inuit do not live in igloos anymore. Today, pretty much the only snow igloos you see are the community igloos in the villages - like the ones we visited in Baker Lake and Gjoa Haven - where elders gather to share the traditional knowledge with the young. Occasionally, one has been left behind by a hunter on the land. Remember how Peter in Arviat showed us he could build one big enough for him to stay a night in less than an hour! Many Inuit families still go out to live on the land in the summer, though. Here they gather berries, hunt and fish, drying food, and practicing the life their people have lived for thousands of years. The tents they use now are most often canvas wall tents instead rather than animal hide ones, but the tradition of being as close to nature and the season is still the same. It is not that long ago that the Inuit moved from igloos to house. In fact, we have met many people on this expedition who were born on the land in an igloo, and who remember its ways. The big transition happened in the early 60's when the Canadian government began to establish settlements. As Sarah from Baker Lake told us, first the settlements were pretty much igloos, a church and school house and a Hudson Bay store. But then, within a short time, the government built houses for them all to move into. The houses are still not quite like the once down South though. First of all, they are often more colorful which makes sense if you think of all the white that covers the surroundings most of the year. Secondly, they are not built on foundations, but on stilts. It would be very costly to make a foundation up here, but more importantly it would not be a great idea considering the permafrost. The heat of the house might thaw out a layer of the permafrost, and the house would simply collapse. Also because of the permafrost, there are no pipes running in underneath the houses - like for pluming or running water - since they would burst. Instead, there are valves on the outside of the house and every 2 or 3 days the sewer truck and the water truck comes by to fill up the tank and empty the other tank. While we stayed at Rita and John's in Gjoa Haven the water truck came by to fill up. Here you canalso see how their house sits on stilts. That means if you are not careful you can easily run out of water. The good thing is that it makes you think about what water resources you are using. Like taking a shower. Think about that for a second. Have you ever thought about how much water you use. Out here where we have to melt snow and ice before we have any water to use (that is our excuse for not cleaning dishes!!). But we also have to think about it when staying at somebody’s home in one of the communities or even when at hotels up here! Do you ever think about how much water you use? Try and measure approximately what you use in a day and you might get surprised. We make and use about 8-10 liters a day, and a pretty standard tank size in the communities for a house is 500 gallons. Try to see how long either would last you! We think it would be pretty cool to compare throughout North American... We wonder if how much water you use depends on where you live!? You could enter the results in A World of Resources Collaboration Zone which we are also visiting for a chat next week. So join us on this topic next Friday. By then we hope to be in Resolute, but first of course, we have a bit of frozen water to cross!